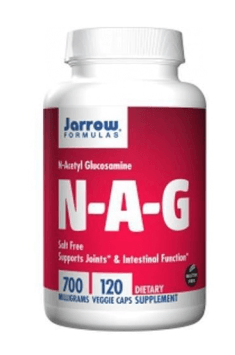 Jarrow N-A-G is a dietary supplement with N-acetyl glucosamine, an aminosaccharide which is an essential precursor for the synthesis of hyaluronic acid – an important component of connective tissue. N-Acetyl glucosamine is a compound widely used by the body because it is a building block for cartilage, connective tissue proper and functional proteins of the extracellular compartment. N-Acetyl glucosamine is absorbed in the small intestine and is transported by the same GLUT proteins as glucose. This is probably due to the fact that this aminosaccharide is its derivative. Sources indicate that its bioavailability (during oral delivery) may reach even 90%. A low amount of administered N-acetyl glucosamine undergoes first-pass metabolism in the liver and the rest is distributed in the body and serves biological functions. The excretion of the “pure” form of this compound is observed via the intestinal route because it is subject to many metabolic processes in the body. Apart from oral delivery, an endogenous form of this aminosaccharide is produced in tissues (mainly connective). Its precursor is glucose (which may come from food and breakdown of glycogen) which undergous enzymatic transformations and binds its parent molecule to an amine group of glutamine and acetyl-CoA. This results in the formation of N-acetyl glucosamine. The latter, also subject to a couple of biochemical reactions, can be used for building important constituents of connective tissue – glycosaminoglycans and consequently proteoglycans. These last elements of the reaction chain show a beneficial impact of this glucose derivative. There are three types of cartilage. The one that builds the joint surface is hyaline cartilage. It is mainly composed of cells (building and remodelling cartilage) and organic extracellular matrix (among others, type I and II collagen, glycosaminoglycans and proteoglycans). This tissue is characterised by high resistance to mechanical factors due to the presence of aggrecan – the main proteoglycan composed of hyaluronic acid that make non-covalent interactions with other proteins of bone matrix, which helps it bind a large amount of water, and has a protective effect. As already mentioned, one of the elements necessary for the synthesis of hyaluronic acid is N-acetyl glucosamine which has thus an indirect protective effect on the joint surface. The oral delivery of N-acetyl glucosamine in degenerative joint disease, which is also an inflammatory process, causes a decrease in the production of proinflammatory agents (including interleukin-1 and cyclooxygenase 2). This leads thus to reduced migration of inflammatory cells which produce enzymes that break down collagen in the cartilage during the course of a disease. This contributes to its degradation which is felt as pain during movement. In addition, supplementation may help replenish aggrecan. The main task of supplemented N-acetyl glucosamine is to reduce inflammation in the cartilage. However, this compound itself is recognised by the body as a direct or indirect substrate in the synthesis of glycoproteins – mucins, integrins and serum proteins. Mucins are found on the surface of mucous membranes of the digestive tract and the respiratory and genitourinary system. As as a component of mucus (along with water and electrolytes), they protect the body from irritants. Integrins belong to proteins which are involved in the migration of cells during embryogenesis and also facilitate the transfer of immune cells to the inflamed area. Serum proteins are a wide group of proteins which serve as transporters (for metal ions and drugs), have immunological properties (antibodies) and hormonal and enzymatic functions and even take part in blood clotting. To sum up, Jarrow N-A-G is a supplement designed for individuals who want to take care of their joints. Supplementation is recommended especially for joint degenerative disease caused by inflammation because it may inhibit significantly degenerative changes in the cartilage and relieve discomfort due to pain. Take 1 capsule 1 to 2 times per day or as directed by your qualified healthcare professional. NOTE: DO NOT use if allergic to shellfish. If you have a medical condition, are pregnant, lactating, trying to conceive, under the age of 18, or taking medications, consult your healthcare professional before using this product. Maintaining good health depends from many factors and the supplement plays thus only a supporting role. The single dose recommended by the manufacturer contains 700 mg of N-acetyl glucosamine which is enough to protect the joint cartilage. It is also a safe amount which is recommended as an addition to your daily supplementation. Isotonic drink with taurine, L-carnitine and glycine. Provides energy and minerals.